Pregnancy is a beautiful part of life, yet for some couples the act of trying to get pregnant can be extremely stressful. Some couples have tried for years and years to get pregnant with little success. We are taught how pregnancy happens, but never taught how to prepare the body for pregnancy. Nor are we taught that fertility comes from the health of the male, not just the female. Lindsay Dam has gone through her own struggles with miscarriages which has led her to her specialty in fertility. Her approach to preparing the body for pregnancy is one that everyone should take into account before becoming pregnant. 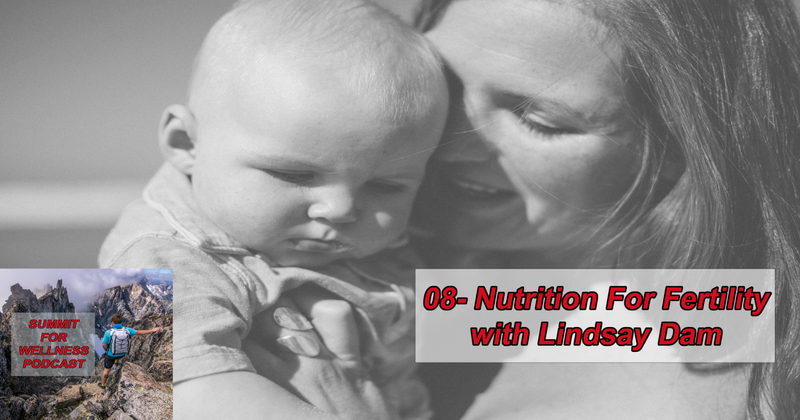 Join Lindsay and I in this fun and entertaining episode of Nutrition For Fertility with Lindsay Dam! Thank you for listening to this episode of the Summit For Wellness Podcast. If you enjoyed Nutrition For Fertility with Lindsay Dam, then subscribe to our channel so you can listen to all the latest episodes. It’s truly very difficult in this busy life to listen news on Television, therefore I just use the web for that purpose, and take the most up-to-date information. Greetings! I’ve been following your weblog for some time now and finally got the courage to go ahead and give you a shout out from Kingwood Tx! Just wanted to say keep up the excellent work!